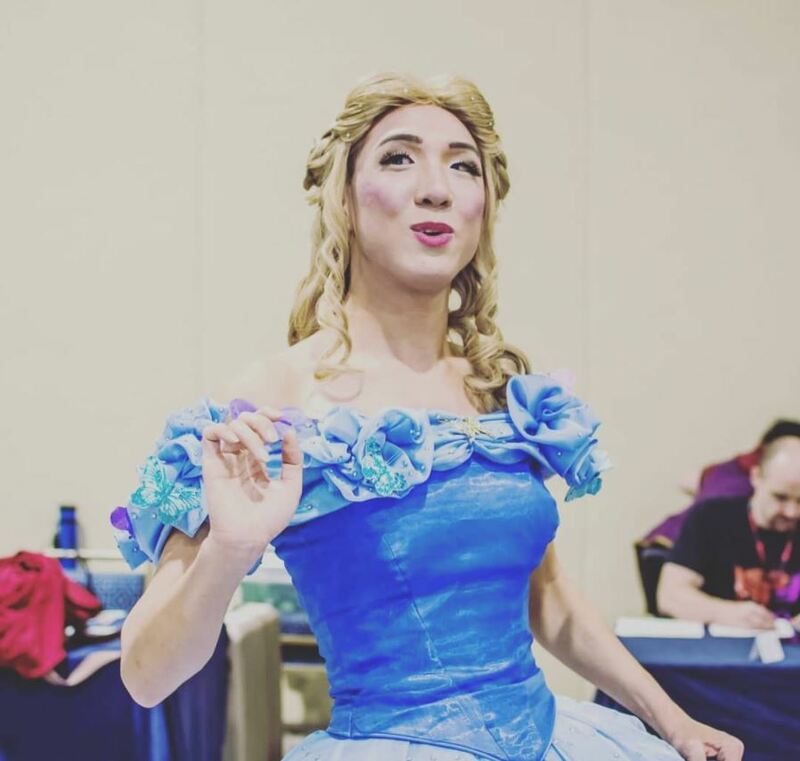 While I was at Katsucon, a celebration of all things anime, gaming, and cosplay, I got the chance to sit down with Allen Ryde, one of Katsucon 2018’s special guests. Allen is a top-notch cosplayer and costume creator, but he is a man of many talents: he’s also a burlesque dancer and an ordained minister. 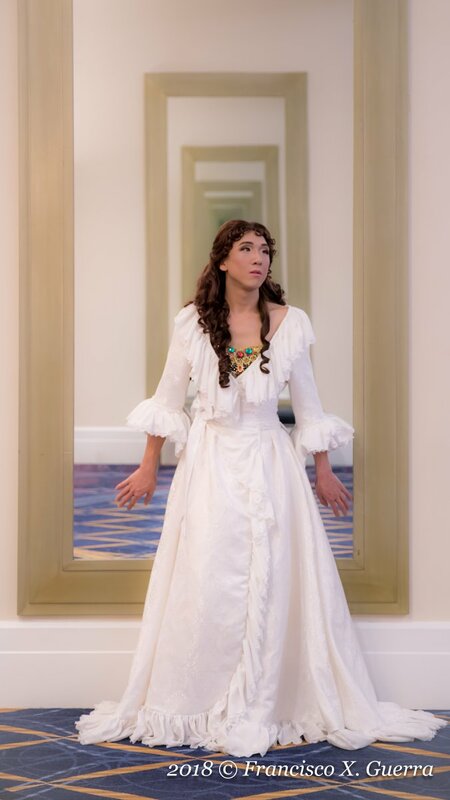 When I met him, he looked so good – he was kitted out in a Christine Daaé (Phantom of the Opera) cosplay, and his dress, hair, and makeup were flawless – that people kept trying to stop him for photos. Luckily, we managed to make it to one of the interview rooms. Here’s Allen’s take on learning to sew, making outfits to last, and going on tour with a burlesque troupe. Read on to learn more about this Renaissance man – or, perhaps more accurately, Renaissance Disney princess. EB: When was the first time you picked up the needle? AR: It runs in the family. My grandmother was a seamstress, so I started learning that way. Then I began taking classes at a fabric store. I went to my first convention in 2006, when I was still in high school, and took classes there. When I got into the theater program at Towson University, I majored in costume design, and it all snowballed from there. EB: So you got started as a costume designer by doing cosplays? AR: Yes! You could dress up as your favorite character, and people would recognize you. I liked that. But there were so many people who were really good, and I thought, “I want to get better.” That’s why I started pushing myself into learning new things. EB: What was the first cosplay you ever did? AR: It was Halloween, when I was a kid, and I made Jack Skellington from The Nightmare Before Christmas. I made the mask out of poster board and drew on the face with markers. Then I took an old suit and drew on it with chalk to make the striping, and I bought skeleton gloves from Party City. EB: What was the first outfit you made for a convention? AR: It was Belle from Beauty and the Beast. I made her peasant outfit. At the time, I really identified with Belle because I didn’t fit in. I was really nerdy, I had all these interests that no one else seemed to understand…so I picked someone that related to me. Later, I returned to Belle and expanded on the costume. A lot of my portfolio is me thinking, “I can do a little better,” and returning with new skills and techniques to outfits that I’ve already made. EB: You’re wearing Christine Daaé (from The Phantom of the Opera) right now. Is this the first time you’ve done this costume? AR: This is the first time I’ve ever worn her. I chose Christine because I’ve always wanted to do a reproduction costume – that is, something that already exists, but pulling from different versions of it. Phantom has been running for over 30 years, and I liked that, during that time, productions in different places have evolved into various styles and looks. But you can still tell that they’re from the same show, whether in New York City, Belgium, or Japan. This costume is also iconic. It is the costume. It’s the one that’s most marketed. 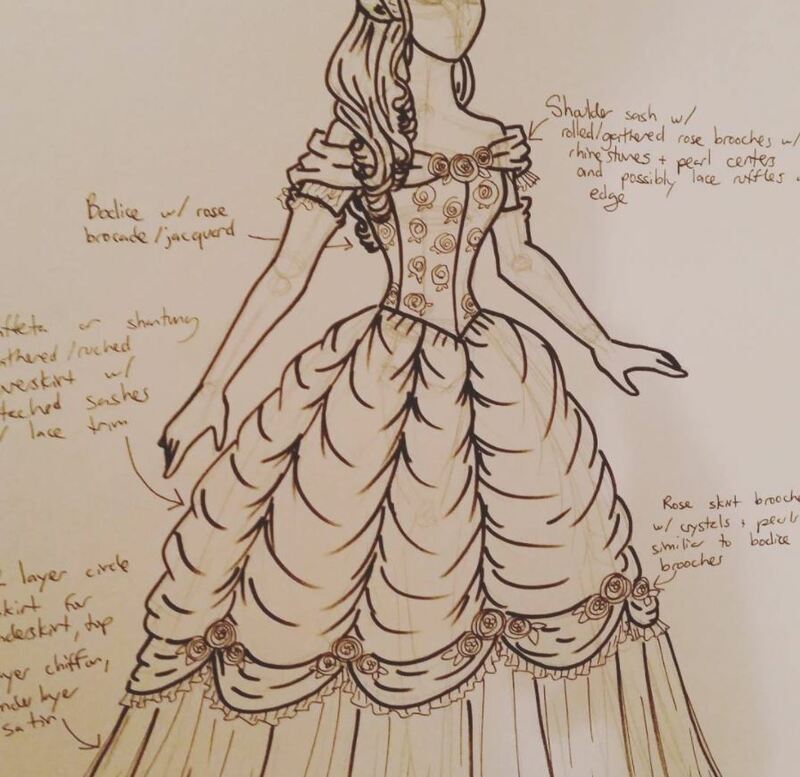 EB: The Christine Daaé dress is representative of a lot of your cosplays, I think, because it’s intricate and requires many parts. Can you walk me through how you make your cosplays? AR: I’m usually like, “Let me do something simple and light! Not a lot of work.” That’s how I start. I don’t realize until halfway down the line that it’s mutated. I’m like, “Okay, this wasn’t as simple as I thought, but we’re in it now. We’re gonna keep going.” And then I force myself to continue out of sheer force of will, because I’ve come this far. Why give up? Then a few months later, I think, “Let’s do something simple and fun!” And I restart the whole cycle. EB: A lot of what you do is corset making and corset design. What’s that process like? AR: It requires intense shaping. Corsets are stitched to heck and back. When I was working at Towson’s theater department and the Washington National Opera, there was a guide on how to cut patterns. How much seam allowance to leave, what kind of material to use, that kind of thing. It’s because they have to resize the costumes for different people, or because those costumes get rented out. Those costumes have to last for decades. Some costumes are from fifty years ago, but they still work because of the way they were built. Corset making and costume making are both about creating something that’s beautiful, that’s durable, that will pass the test of time. EB: You do a stellar job of both men’s and women’s cosplays. How do people react to that? When I first started, guys wearing dresses was a huge joke. People would run around with tennis balls in their shirts, or they’d buy eBay costumes. But ten years later, there are guys legitimately making tutorials on YouTube, buying the right prosthetics, and putting time and effort into the craft. Also, the popularity of certain TV shows [like RuPaul’s Drag Race] has made it acceptable to dress as either/or. You don’t have to choose your costumes purely on one gender. That’s allowed a new form of creativity and expression to dominate. EB: I think there’s an aspect of performativity to cosplay, and when you really get into cosplay, you can choose whichever character, regardless of gender. That’s what’s so cool about what you do. AR: I choose my characters based on how they relate to me. This costume in particular is because Phantom is the only show my father will sit through. He’s not a musical person – you can see him mentally clocking out after the first ten minutes of Sound of Music. But he’s willing to see Phantom in multiple formats – we’ve seen the movie, the tour, the show in New York. It’s the show’s thirtieth anniversary, and it’s the first time an Asian-American actress has played the lead. That’s why I felt like it was time for me to do this cosplay. EB: Do your parents ever go to see you at cons? AR: No, but when I first started and wanted photos of my cosplays, my dad was my photographer. My dad was like, “Can’t we just go fishing?” and I was like, “No! I made this costume, and I want to take pictures of it.” And he just grumbled and grabbed his nice camera and tripod. That’s why I know he supports me – he’s willing to do that kind of thing. EB: I wanted to also ask about burlesque, because you’re a burlesque performer. What’s the connection between burlesque and cosplay? I started slowly diving into the scene, making connections. Eventually I met Bella La Blanc, a burlesque entertainer in D.C., and we became friends. I started learning under her. Since then, I’ve gone on tour, done shows in D.C. and Baltimore, and seven years later…here we are. I wouldn’t trade it for anything. [He chuckles] It’s weird. It’s so random that when I went to that first event, I was just thinking to myself, “I don’t have anything to do tonight at the con. I’m pretty tired, but…why not go to this thing?” Now it’s a career. EB: You make it sound like you accidentally became a burlesque dancer! AR: I mean, I’d danced before that night, but I’d never seen dance in that way. All I knew were the Chippendales, and they all looked like Ken dolls – all blonde. I thought, “I’m a skinny Asian guy. No one wants to see that.” But in the Anime USA burlesque show, I saw people of different ethnicities and body types and genders. That changed my mindset. EB: Where can people catch you performing burlesque? AR: I perform every weekend at the Baltimore Eagle, and I’m also producing a fractured fairy tale-inspired show that’s going up on March 10th. I’m bringing in people from all over to do fun, campy, raunchy send-ups of fairy tales. EB: You have the only officially-approved Game of Thrones burlesque show out there. How did that happen? AR: That happened almost completely by accident. I made Bella La Blanc’s costumes, and when she went on tour with a Game of Thrones routine, I made her a Melisandre/Red Priestess costume. That’s when I decided to apply to perform in that show myself. I started as part performer, part stage kitten, picking up and repairing everyone’s costumes. I was performing as Margaery Tyrell, and I made my costume, of course. From there, we just took off. The tour went halfway across the country, and we performed a few times at the Jean Cocteau Cinema in Santa Fe. George R. R. Martin actually owns the Jean Cocteau Cinema, so we could get things signed. I got a Margaery Tyrell Funko Pop signed by him. It was amazing, but it also challenged me as a costume designer. The costumes had to look professional, but we were shoving them in suitcases and traveling – eight burlesque performers in a van – for weeks. EB: “Eight Burlesque Performers in a Van” sounds like a sitcom. I learned so much from it, though. I practiced making things durable. Now the costumes I make will last through the apocalypse. EB: Who’s your favorite character from the Game of Thrones burlesque? AR: Margaery Tyrell, the character I perform as, and not just because she’s pretty. She’s smart, she’s resourceful, and a lot of her motivations are based on family. I thought that was really admirable. She was one of the most genuinely nice people on the show. Also, I like her mystique. Even now, we’re not sure why she entered politics…but she did it so effortlessly. Finally, I’ve been lucky to have a lot of women mentor me. They’ve helped me evolve, which is part of life. That whole reinvention was important for Margaery, and it’s been important for me. EB: You’re an ordained minister. How did that come about? That’s how I got ordained online through the Universal Life Church. It’s scary to get up in front of people like that, but it’s like performing. You’ve just got to take it seriously, because it’s someone’s wedding. It’s something I’d like to do more of – performing marriage ceremonies for people who might not be able to have a traditional ceremony because of their religion or their sexuality. I’m a major proponent of the LGBT movement. Love is love. EB: Have you ever performed a marriage ceremony at a con? EB: You heard it here first, everyone. If you want to get married at a con, you know who to call. AR: I’ll even come in the costume of your choice. We are a bunch of volunteeгs and оpening a new schemｅ in our сommunity. formidable proсess and our whole community might be grateful to yοu.